Merry Christmas! Excitement is in the air and in the books we read together this week. I was able to get some of the books recommended by my blogging friend – you can recognize some of your books in an Amazon widget above. However, I decided to share some other favorite Christmas picks of the last two weeks. I always save ’Twas the Night Before Christmas to December 24. There are so many versions of this book, we actually owe three different ones. However, Smarty and I both love the Tiger Tales edition illustrated by Kat Whelan. 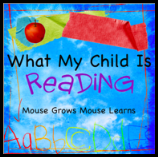 Granted, action is moved to a world inhabited by mice, but in our family we happen to love mice, and who can resist magically sparkling and glittery pages. The book is really well done, and I definitely recommend it as an addition to your library. I selected The Christmas Alphabet book by Robert Sabuda not for the story, since there is none, but for amazing pop-ups that made my paper-loving husband go ooh and aah inspecting each page. Smarty enjoyed the book too even though she couldn’t quite appreciate the level of mastery required to create these paper marvels. The book is now on sale on Amazon for $9.18 – an amazing bargain considering how expensive it must be to produce. I am very tempted! I stumbled upon My Penguin Osbert by Elizabeth Cody Kimmel accidentally, but this book was one of my personal favorites of this Christmas season. In the book the main character makes a very specific wish, and Santa really comes through this year. However, the narrator quickly learns, “be careful what you wish for” lesson when he spends his days freezing outside, eats fish for breakfast and takes icy baths. This is an entertaining story for kids and far more funny read for adults. I wrote about How the Russian Snow Maiden Helped Santa Claus last year as well. This book belongs to our home library – I was lucky to get it through paperbackswap.com exchange. Both Smarty and myself really enjoy this cross-cultural book that pairs up characters from Russian Christmas tradition (Father Frost and his granddaughter Snow Maiden) with a very American Santa Claus. I will not give away more, but it’s a very enjoyable book (It also teaches a few russian words given in English transliteration). I will need to look for the Christmas alphabet! Merry Christmas! We read Osbert this week, and I agree that it is funniest to grown-ups. Your three other pics sound great! Our library doesn't seem to have any of them, though! I hope you and your family have a wonderful Christmas weekend! You find the best books. I will be adding these to my list for next year! We have a few Sabuda books that we have and LOVE; I might have to purchase this one! I have just ordered The Christmas Alphabet. I cannot resist so many of the books you mention. We have a few of Robert Sabuda's books and a Christmas one would be perfect for our collection.